I have been to Slovenia twice; the first time I used the public transport and the second time I hired a car. 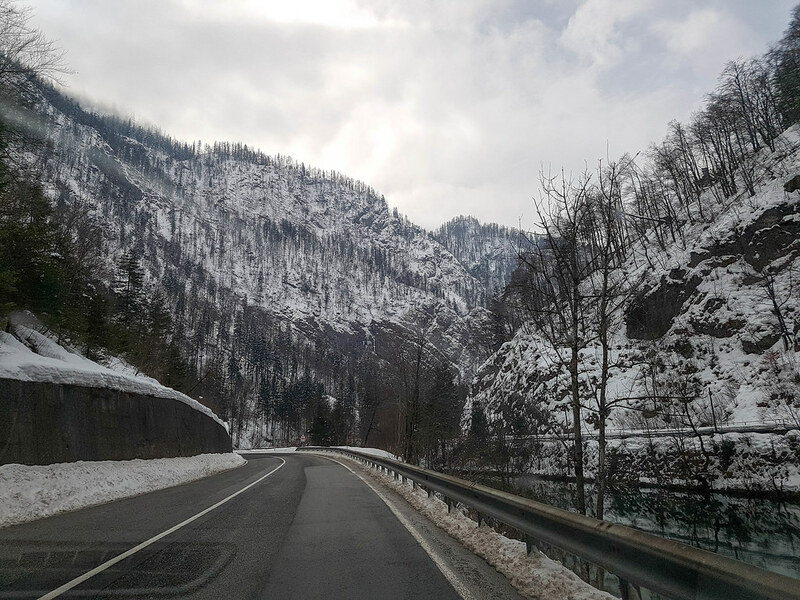 As Slovenia is a wonderful country with stunning scenery, I do recommend hiring a car so that you can have the freedom to visit off the beaten path places and saves you a lot of time (and money). You might think that the process of renting a car in Slovenia is quite straight forward but it’s not really. 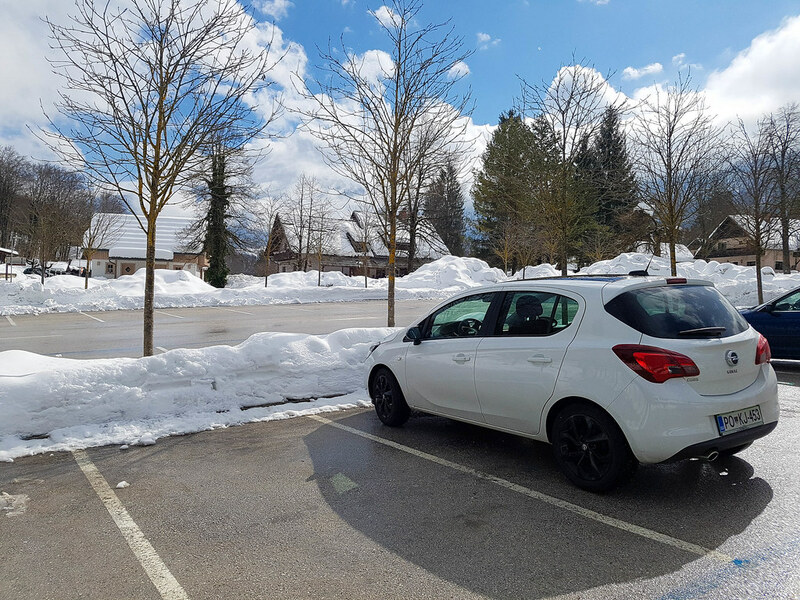 You do need to know a few tips and tricks in order to save money, and this is why I am writing this complete guide on how to rent a car in Slovenia, based on my own experience. Why should you rent a car in Slovenia, you might ask? 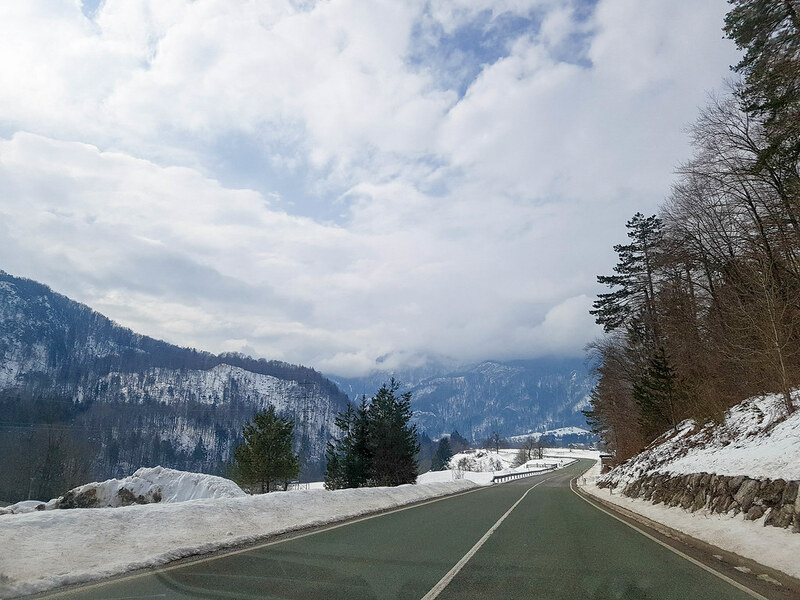 Sure, you can easily reach Ljubljana from the airport by shuttle bus, and from the capital there are frequent buses to Bled and Bohinj, two of the most popular destinations in the country, but if you want to explore at your own pace then you do need a car to travel around. Hiring a car in Slovenia is also cost-effective, especially if you are traveling with your family. For example, you can rent a car for about 20 euros a day, which is the equivalent of a return ticket from Ljubljana to Bled, by bus. The further away you book, the cheapest your car will be. I use Holiday Extras to find the best deal on rental cars. They have a search engine that shows you all the deals from all the car rentals in the airport and in town, so you can choose the best one for you and your family. You can browse through different types of cars, manual and automatic, big or small, and compare the prices. They also offer free cancellation, theft protection, collision damage waiver and you can book without your credit card and without any booking fees as well. I hired my car using them for £40, for 4 days. The all-inclusive rental car insurance – watch out for hidden costs! I remember standing in line at the airport, waiting for the couple in front of me to get the keys for their rental car when I heard the magic words “deposit”. Going back to the online booking, when I reserved my car I have been asked if I want to pay an extra tenner a day for full protection in case the car is damaged. Needless to say, I chose not to. I truly advise you not to follow my example and do book the full protection! Back to the counter, when my turn arrived, I was asked the same question: “Do you want to pay for extra insurance or leave as a deposit of £1200?”. If I would have booked the full protection online, I would have paid only £40 extra. When I booked it at the airport, I had to pay £120. You can choose not to pay it, but then you are liable for anything that happens with the car, including scratches that can happen in the parking lot and are not even your fault. So, do take the full protection in the same time when you book your car online, for peace of mind and no extra hassle at the rental office. Where to rent a car in Slovenia from? The easiest way to hire a car in Slovenia is at Ljubljana airport. Here you will find all the major companies, like Avis, Hertz, Europecar, Exterprise or Sixt. The rent – a -car building, where all the offices are, is across the street from the arrivals terminal. You can also rent a car in Ljubljana or other smaller cities, like Bled, if that’s the start journey of your trip. Some companies do prove a pick up and collection service free of charge for distances lower than 30 km from the airport (Ljubljana is 20km away from the airport). 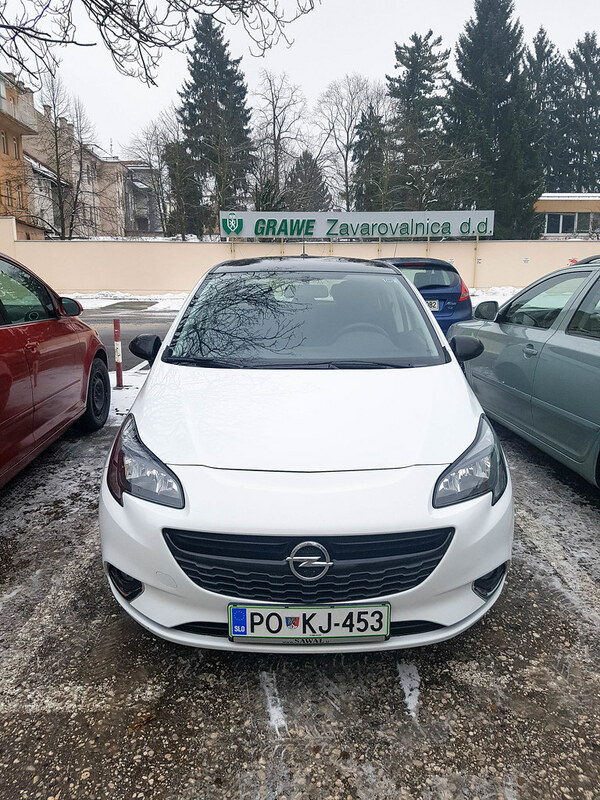 What do you need to hire a car in Slovenia? First of all, to hire a car in Slovenia you need to be at least 18 and have a driving license for at least 2 years. You will be asked for you passport as well when you pick up the car, and it needs to match your driving license. If you are under 25 years old, mot of the companies will charge an extra young driver fee, per day. If your license is printed in a different language that uses a different alphabet than the Roman one, you will need an international driving permit. Otherwise, your national driving license will be enough to hire a car. In order to hire a car, you will need a credit card. Prepaid or debit cards are not accepted. My advice would be the smaller, the better. But that, of course, depends on how many members your family has. I hired an Opel Corsa, a small car, easy to park and with low fuel consumption. A smaller car is also easier to navigate around through towns. My Opel Corsa was brand new, with only 1500 km on board. For a larger family, a cost-effective solution would be a 5-seater Renault Clio, Volkswagen Golf or Opel Astra, all being only a few quid a day more expensive than a smaller car. If you want more space however, you can always opt for a Skoda Octavia, a Volkswagen Passat or a Mazda 6, but be prepared to pay almost double the price of a small car. The selection of cars you can hire in Slovenia, at the airport, is large, ranging from small, large, estate, minivans or SUVs. However, being a small airport, with a small garage for rental cars, do book online if you want a particular type of car. Take advantage of the “Full to full” policy and don’t pay in advance for the fuel tank. The agent at the rental shop will try to advise you pay, but there are plenty of gas stations around the airport where you can fill the tank up before returning the car. The rental will ask for a payment between £40-£60 for a full tank, but if you do it yourself you will save money. As an example, I only paid £10 to fill up the tank, the last day, just before returning the car. Make sure you read the documents of your car before going to the gas station, to know what kind of fuel it needs. Do you really need navigation? You should know that most of the cars will come without a navigation system. Hiring one from the rental company will cost you another £8/day. These days however, with no roaming fees in Europe, you can use the data on your phone and use Google Maps as your navi. Another solution would be to download the country map from Google Maps and use it offline, it has the same precision and landmarks as the on-line one. However, as the GPS does eat quite a lot of the battery, bring a power bank with you as well. It will be cheaper anyway than hiring a GSP from the rental company. Does your care have winter tiers included in the price? When you book online make sure that it is mentioned what kind of tires your rental car has. Slovenia in a country with many mountains, snow and low temperatures during November 15th – March 15th. You will need winter tires during this time and if they are not included then you will have to pay extra. If you want to save money, consider hiring a manual car instead of an automatic one. Automatic cars come at a higher price and you do need to book them quite some time in advance to make sure there will be availability. In Europe manual cars are much more common than automatic ones. However, if you only drive an automatic back at home and don’t have a licence for manual cars as well, you won’t be able to rent a manual. You should know that for any extra driver you will have to pay another fee/day, so think well if you really need someone else to drive the car. Slovenia is quite a small country and there are no long-distance drives (the longest may be around 4 hours, if you want to reach Piran). As I mentioned above, hiring a smaller car is much cheaper to run than a bigger one. My Opel Corsa only ate about 5L/100km, which went a long way! Driving in Slovenia is a pleasure as the roads are very well maintained, especially the highways. Slovenia might be a small country, but it does have over 450 miles of highways, so it’s easy to reach everywhere quite fast. The speed limit in urban areas is 50km/hour, otherwise specified, 90km/hour in non-urban areas and 130km/hour on motorways. Note that you should always have the dipped lights on, even during the day. It’s law in Slovenia. The wear of seatbelt is obligatory for the driver and all the passengers in the car. Do not drink and drive! The law allows you to have an alcohol level of 0.05%, which is the equivalent of a small beer. But driving a rental, and having a deposit on the car, it’s advisable not to drink at all. Alcohol breath tests are quite common in the country, so better not risk it. There are service stations opened 24 hours every 30km on the motorway, where they also sell food and refreshments. First of all, check with your hotel if they provide free parking and how secure it is. My hotel in Bled, Astoria, offered free parking in their underground garage, which not only protected the car from the bad weather (it was snowing heavily during my visit) but also gave me peace of mind that it is in a secure place. Before you book your hotel, check the amenities and see if they offer secure parking, and if it’s free or at an extra cost. I always use www.booking.com to book my hotels and never been disappointed. You will find plenty of public parking lots in central Ljubljana that charge around 1 euro/hour. I recommend to always park in a secure public parking and not by the side of the road, especially if you have luggage in your car. During low season, some of the park meters will be out of order. This happened to me at lake Bohinj, so the parking was free. In the cities, there are two kinds of zones: white and blue. The white zones, marked with white lines, allow you to park there for a maximum of two hours. The blue lines allow you to park only for 30 minutes. For more than this, you have to use a public parking. You can hire a car in Slovenia and take it across the border, for an additional charge of around 10 euros/day. Make sure you check with your rental agent first which countries you are allowed to take the car to. Some companies refuse the entry to Greece, Serbia, Montenegro and Bosnia with certain types of cars. If you cross the border with your rental car but don’t tell the rental company, you might end up paying a fine of over 500 euros. If you do take the car across the border make sure you buy the appropriate vignette (road tax) for the new country at the first petrol station after the border and display it on your windscreen, otherwise you risk a fine. What happens if you have an accident with a rental car in Slovenia? If bad luck hits and you do have an accident in Slovenia with your rental car, make sure that the first thing you do is let the police know at 113. The emergency number in Slovenia is 112. Such an informative post. I don’t drive however I can definitely see why renting a car is such a great idea! Just love your photos of them stunning views. I’ll keep this in mind. I do prefer to hire a car. It’s just easier to get around and explore. Great post. We went in Maramures, Romania a few weeks ago as a getaway and we had so many problems with the transport. I would have so much easier if we would have had a car. So I get how important is to get informed before you go and get a car so you will save time and be able to see more. I love this kind of post. Its detailed and actually informative. I’ve not been to Slovenia, though I’d like to go someday. Despite being all eco-hippie-dippie, I do prefer travelling by vehicle once I’ve arrived in my country of choice, as its the best way to really see places that aren’t urban or town centres. This sounds like a great way to get around Slovenia if you are headed that, plus hiring your own car means you can see and go where you want, when you want. Thanks for this! We rented a car in Croatia last year and had a very similar experience! We want to go back to this region and rent a car to travel all over the Balkans! This was helpful, any idea if it would be cheaper to rent a car in Slovenia over another country? I hear Slovenia is a bit more expensive than some of the other countries in the Balkans. When I’m on vacation I like having my own transportation. It just makes going and coming so much easier, rather than having to wait on public transportation. We have always wanted to visit Slovakia so will be book marking your site for when we do. This post is really helpful as we plan to hire a car there. Very good post and is good and fab to see posts about this as something I have not a clue how to start with hiring . Great info! I would rather hire a car anytime we travel, actually. I like to be responsible for my own travel and not have to wait for anyone else, ya know? This is great for me having never been to Slovenia before. Sounds like booking the full protection online is the cheaper option. These are such great tips. We have only rented a car one time for our trip and I would love to visit there! these are all such great points, i normally rent a car when i travel, unless it’s like NY and public transportation is the norm or I uber but if I really wanna explore then for sure I think the renting car route is best. If we ever travel to Slovenia, we will absolutely be sure to rent a car. We’ve tried using public transportation when visiting places and it really does ruin the entire experience for us because it means sticking to a more firm schedule. Hiring a car is actually simpler and cheaper than what other people think. We always hire one every time we go on holiday because it’s easier and feels more comfortable other than spending on cabs. Great tips! We really like renting cars on holiday because you get to see so mcuh more. If you don’t have an European sim card and don’t want to pay for data, I have found Maps.me to be a useful app. 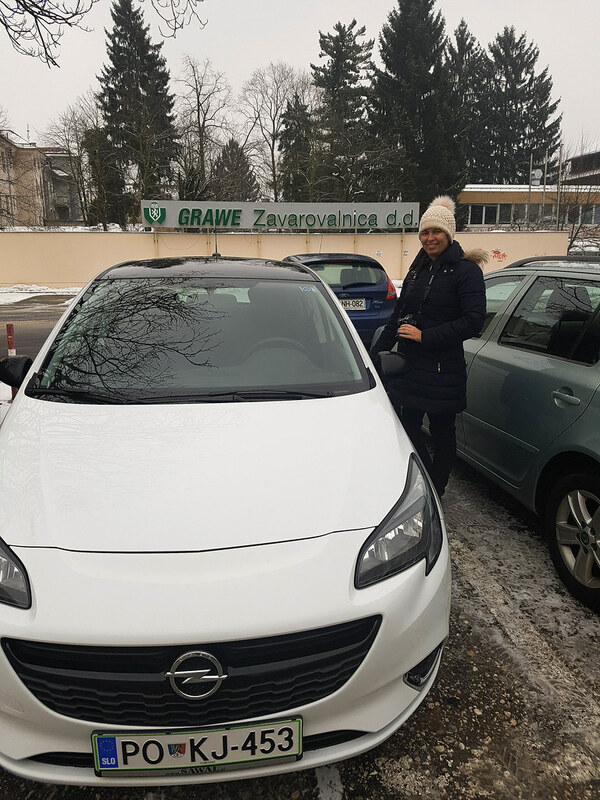 Thank you so much for all of the information regarding renting a car in Slovenia! Lots of really important detail and guidance. I need a GPS to get around my home town. I’m so thankful that my phone tells me where to go. I would love to travel round Slovenia exploring and it seems like hiring a car is a good option. I would love to visit Slovenia, especially Lake Bled. I’ll definitely consider driving after reading this post. Thanks! Interesting post. I’ve had a car in the UK, but never abroad! There’s so much to think about – like all the little extra’s to pay for. Thanks for this comprehensive post. 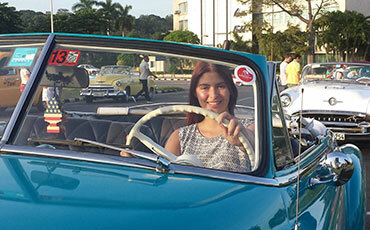 Hiring a car abroad used to scare me, but it gives you such freedom and flexibility – I love it. My partner and I would love to visit Slovenia and would definitely hire a car to do some exploring. Such great tips! Slovenia sounds like a really neat place to visit! Your experience about the different prices for full protection online and in person has made me wonder if this is similar for other companies/countries. Thank you for such a wonderfully detailed post! I don’t drive myself but this is very useful and I will keep in mind for when I travel with someone who does. Driving certainly gives you flexibility. The renting rules seem pretty stardard and aligned with the countries where I have rented a car before. As for the full prtection, I made the same mistake in the past. The thing is – you never know. As you put it, our rental car may suffer a damage while in a parking lot and it’s not even your fault, so it would be bad having to pay for something you’re not even directly responsible. So it’s good to always pay that little extra and have peace of mind. Great post! So informative. I usually hitchhike but it’s very tiring and restraining to always depend on others. Now I’m over 25 so I will definitely save this post on my favourites so I can take a look at it again when I finally make up my mind to head to Eastern Europe, can’t wait!! Thank you for writing this! Thank you for such an informative post. Your tips are so useful, even for people not considering car hire in Slovenia in particular! I’m dying to visit ‎Ljubljana and Lake Bled so hiring a car would be the perfect option for me, thank you for sharing, I’ll definitely look Holiday Extras when I book my trip. This is great information. I will keep this is mind next time I plan a visit. Great tip on hiring a manual instead of automatic car! This is so interesting! I have no plans to visit Slovenia but it is always useful to know these things for future reference! I know I always prefer to rent a a car when I go places. It just gives me the convince to go and please as I would like. Thank you for the information. I think saving money is always a good thing when traveling as long as you don’t go to the extreme. This is such a detailed post. A real navigation problem solver for anyone visiting Slovenia. Yeah sometimes hiring a car is more practical and convenient. I would rather a car and drive on my own pace than travel buy bus and deal with stress. Thanks for your guide. I think I would be okay driving in Slovenia. I have done it in France, Italy and New Zealand and all was fine. I had that £1200 deposit issue when I rented a car in Italy and had to pay for the insurance so I guess that is a pretty common thing when you rent a car! I do agree that renting a car is more cost effective and also gives you more freedom! It is always a good idea to hire a car no matter in which country. It has many advantages. You can do what ever you want. Great information gem! I’ve always suggested to my husband to rent cars rather than hire a car with driver when we travel. Maybe in Slovenia he would consent? 🙂 Thanks for sharing! This is a brilliant idea. Though we do not have immediate plans of visiting Slovenia, I will make sure to keep this in mind. I have never tried renting a car when abroad but moving forward, we will definitely consider this for peace of mind. 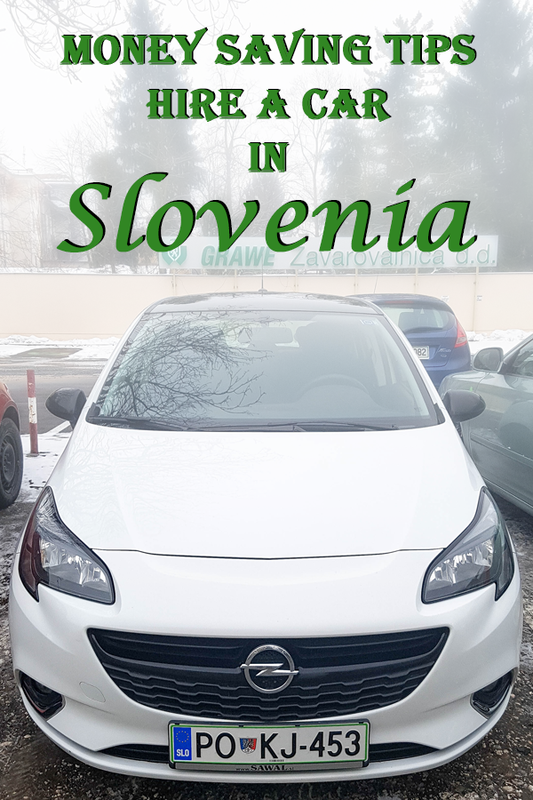 Wow, I thought that renting a car in Slovenia is just a walk in the park, but it takes a lot of things to consider and I love that you have provided a useful tips for all of us. I agree that renting a car is the best thing to do here because you get to save not just money, but also time. Thank you so much for sharing this, indeed it is a great help. Wow it’s so efficient to rent a car in Slovenia compared to other countries! How much does parking cost in Slovenia typically? I also love the views of your countryside. I can just imagine cruising with that view. Thank you for the great post! First of all, this is my first time to hear about Slovenia but your stunning pictures made me so eager to visit this place one day. As for the car hiring, i definitely agree with you about all its wonderful advantages. Although I used to embrace the public transportation as they are more budget friendly, hiring a car is truly ideal as it gives you freedom not just with the time you consume but also a chance to explore a country or a place in full extent! Wow! Slovenia is one amazing place to visit, just look at those breathtaking views! I only see these on the postcards sent to me by my swap mates, and I do not think the postcards do the place justice! Yes, I agree that it will be much more convenient to hire a car here instead of going for a cab or whatever other form of public transportation they might have there. Hiring a car will make it easier for you to move from one place to another sans the hassle. And how convenient it is to book one online! Plus, you can even travel beyond the borders! Good value for money, I must say!